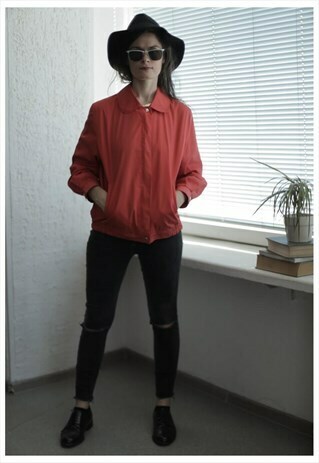 Amazing vintage early 80's rose red long sleeves jacket with two metal clasp buttons and a hidden zip fastening on the front, elasticated bottom, round collar, inner lining and two slanted front pockets. Uk size not written but looks like 12. Model size on the photo is 10. Measurements: length 24 inches, sleeves 22 inches, chest 42 inches, waist 42 inches, hips 39 inches (elastic).